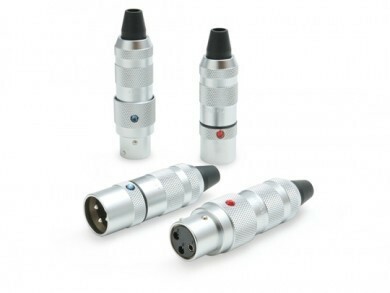 2 male and 2 female connectors in each set of Oyaide’s excellent Focus 1 XLRs. One-touch push-pull function is the entirely-new locking system. You can lock just by inserting Focus 1 into the inlet and unlock by pulling the tip ring. Ball-bearing system, manufactured by ultra-precision machining, is employed for its locking mechanism. These functions deliver smooth and absolute plug connection. In addition, an innovative idea is utilised for the contact of Focus 1. The No.1 contact pin (earth) is 3mm longer than other pins, so that it contacts fast for the purpose of protection from POP noise at the moment of connection. Furthermore, bladed cable clump is employed for cable fixture. By applying this clumping system, it is possible to connect chassis ground and stabilise cable simultaneously. Due to its 12mm install cable O.D. (when cable bushing is removed), it gives infinite possibilities for DIY enthusiasts; and its tapered insertion hole makes cable installation easier and avoids cable disconnection by bending. Furthermore, a rubber ring which is installed at the junction of the body and housing acts as vibration damper and loosening protector. The contact pins of Focus 1 are made from phosphor bronze bar that is precisely shaped by CNC machining. After careful machine barrelling, silver (inner) and rhodium (outer) are directly plated on them. Then, the pins are moulded into highly rigid 30% glass-filled PBT, which insures high-speed vibration attenuation. The body and housing, processed by CNC machining, are high-density and have a high shielding performance compared to an existing lost-wax processed body. For its surface treatment, hard chrome-plating is coated like the body of camera.